Whether you're planning your own wish list or searching for the perfect gift for others, these fabulous gift ideas are sure to be a hit with all the women in your life. If there is one thing I love more than shopping, it's giving and shopping for others. There's nothing better than the feeling of finding the perfect gift and knowing it's going to put a smile on someone's face. It's even more satisfying when you find the perfect gift AND a great bargain. Today, I've done all the searching and bargain hunting for you and put together a great list of affordable items that any of the women in your life will appreciate. Whether they are a crafter (hello, Cricut! ), girly girl or athlete, you are sure to find something for every women in your life. What are some of your favorite gifts to give to the women in your life? I tend to buy what I want and need throughout the year, so there's nothing that I'm really hoping for this year. To be honest, as long as my kids are happy and I get to see the joy on their face Christmas morning everything else is just icing on the cake. 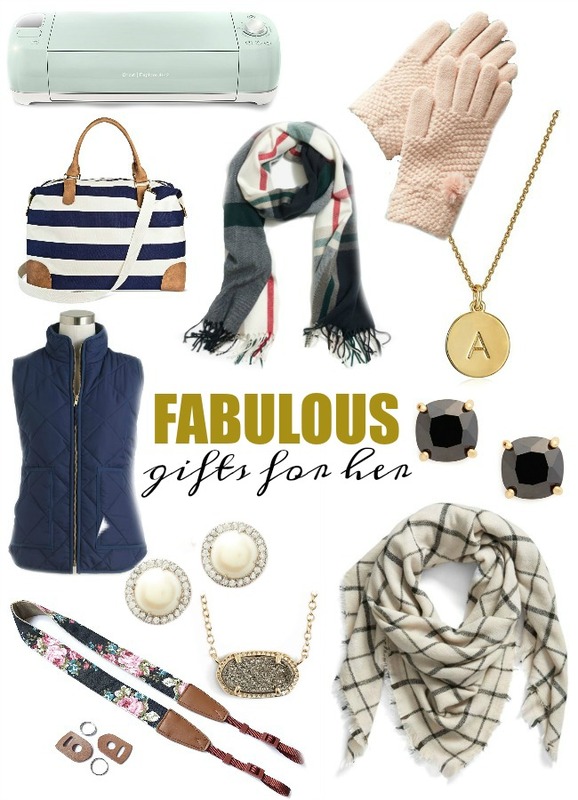 that top scarf has been our number one catalog seller! right now at work i spend my days helping customers and fulfilling online orders and that scarf has been packed by me several times this week!!! too funny! it's interesting seeing the things that go! I asked for 3 of these exact things for Christmas! Haha :) The Kendra Scott necklace, the J Crew scarf, and the MAC eye palette. My hubby bought me a Cricut last year for Xmas, but I'm embarrassed to say I still haven't used it... It is kind of overwhelming for me to just start. Do you have one and could you do a post with a tutorial? ?